Valorie Kondos Field completes her final season as coach in March. UCLA gymnastics coach Valorie Kondos Field finished the last home match of her final season in March. "Miss Val" leaves behind a legacy that includes seven national championships and over 500 wins. In her honor, the floor at UCLA's Pauley Pavilion was renamed the "Valorie Kondos Field Floor." When Valorie Kondos Field arrived at the University of California at Los Angeles 37 years ago, she had very little experience in gymnastics. Her life up to that point was in dance. She knew about being a competitor, though, and soon enough, she took the program under her wing as coach and never looked back. Finishing her final season this year, Kondos Field was inspired by the legendary basketball coach John Wooden in changing the culture around UCLA's gymnastics program. "If your definition of success is winning, then you will put winning above teaching humans," Kondos Field said. Kondos Field, affectionately known as "Miss Val," saw gymnastics as an avenue to also teach life lessons. 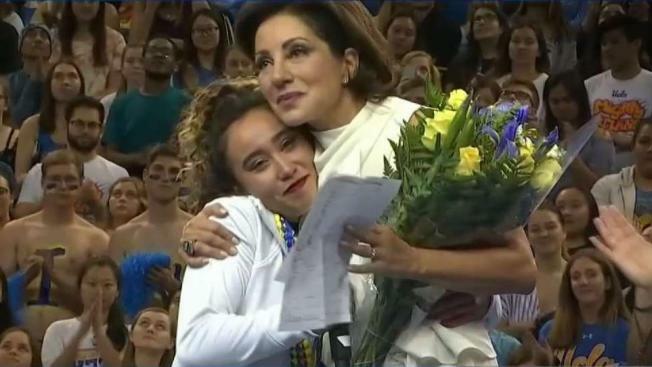 "I think by putting her focus on us as people before athletes reiterates that you don't have to get a 10 or you're not validated by your score," UCLA senior gymnast Katelyn Ohashi says. Ohashi, whose floor routines continue to break the internet with their genre-bending blend of dance, art and sport, was ready to give up on gymnastics just a few years ago. Mentoring from Miss Val, however, reminded her of how fun the journey to success can be, despite the challenges along the way. Kondos Field leaves behind an unforgettable record at UCLA, earning seven national championships and over 500 wins in total. Her legacy, however, will be measured by how she was able to connect with her athletes as people. On March 16, Kondos Field ended the last home meet in her final season as coach in touching fashion. Pauley Pavilion at UCLA honored Miss Val by renaming their floor the "Valorie Kondos Field Floor." Now leaving on her own terms, Kondos Field hopes to take her skills earned as coach and apply them forward. "I've been preparing myself the exact same way I've been preparing seniors every single year," she says. "I say, 'You know what? You've learned all there is to learn in this environment. Now take everything you've learned, graduate and go out and put it into a new endeavor.'" Miss Val plans to pursue new ventures in theater production and motivational speaking, looking to continue spreading her message of how adults can be better mentors. "We need to reeducate parents and coaches as to what really happens in a young person's mind, emotions that translate physically when they are under so much pressure to be perfect, to be the best," she says. "My new mission is to speak worldwide about how to make sure that you infuse joy in the learning process, in everything you do." Not long ago, Miss Val was diagnosed with breast cancer, which forced her to seek the positivity in every life obstacle – no matter how staggering. "They knew the chemotherapy was going to work, if I chose to get it," Kondos Field says. "Once I realized that, I didn't 'have' to get chemo. I 'get' to get chemo." "Changing that one word – from 'have to' to 'get to' changed every moment of my life since then," she says. How she overcame this challenge, along with many other anecdotes, are detailed in her book "Life is Short, Don't Wait to Dance." With it, she recalls many of the defining moments that came from the mats at UCLA – a place she will always be connected to. "I feel like UCLA is this living, breathing entity – it's alive and it's given me so much," Miss Val says. "I'm so thankful."